In last week’s post on our superb Silver Needle White Tea (the post can be found here), I briefly discussed the Wuyi Mountain region in China and its influence on tea. After writing a brief description of the tea sub-region, I realized that I would be remiss if I weren’t to go further in depth on the region in the future. The Wuyi Mountain region truly is special to the tea world and to fully explain why, I thought it was only appropriate to dedicate a full post to it. In this post, I will be discussing the ecological conditions of the Wuyi Mountains, the tea grown there, and the people who grow it. From a purely geographical perspective, the Wuyi Mountains are located in Fujian Province, in Southeast China. The mountains themselves are jagged with sheer sides and light brown rock. Looking at the mountains, it is readily apparent that they are somewhat small in size, compared to the stereotype grey rock with white caps that comes to mind when one hears the word mountain. Instead, these jagged, short (short being a relative term; they are still quite large) rock mountains are instantly recognizable by their highlights of deep green foliage. Protected by the United Nations as a “World Heritage Site,” the Wuyi Mountains are one of the rare tea growing regions in the world that are protected from ecological harm by the greater international community. The protections that have been put in place to protect the pristine mountains have resulted in the ability for the region to produce some of the premier teas of the world. The most common tea coming from the region being Oolongs of medium roast style, the region is also perfectly suited for other types of tea, like our Silver Needle. Tea growers whose families have farmed the same tea gardens for generations (in many cases, centuries) still farm the same gardens in the mountains today. The rocky but rich soil lends a wonderful rock-mineral taste to the leaves grown in it which is hard to describe to someone who hasn’t yet experienced it. Similarly to how certain mineral waters are naturally mineralized by bubbling up through rocky springs, the tea leaves can often have those same mineral qualities on the palate. What makes Wuyi so great a region for tea growing is not just the added mineral taste that it lends to the leaves grown there, but the mountain’s pristine water quality and pure air make it one of the few environmentally undamaged growing regions in the world. There is a common understanding among tea growers that to create a pure and healthy tea, the tea must be grown in a pure and healthy way. Of course, this can only be accomplished by making sure that the water being taken in by the tea plant is pure and healthy, and that the air it is surrounded with is free from pollutants. It is a task that is growing ever-difficult in a world with increasing issues of pollution and land destruction. 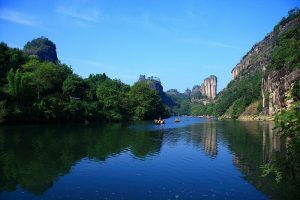 Wuyi’s specific location and elevation means that it is relatively safe from the possibility of pollution being blown in from elsewhere. Wuyi can be thought of as a time capsule of tea growing regions. Before industrialization, China’s tea gardens were family owned and operated and were centered around the purest sources of natural water. Today, air and water pollution, and the buying up of tea farms by big businesses like Lipton and Tetley have greatly reduced the number of traditional tea growers who still value environmental well being and the quality of their products. As for the tea growers themselves, the majority are small family farmers. In many cases these families have been farming the same land for centuries, which allows the families that have been accumulating expertise in tea growing control over their products. Their passion, respect and love for the land, and their mastery at every part of the tea process has created some of the most widely loved teas in the world, our Silver Needle being no exception. The culture of the region is a unique situation. Relatively secluded from the rest of the world, and dominated economically by the tea industry, the Wuyi Mountains are a perfect example of a small agrarian society. Festivals, holidays, and local stories and folklore all centre themselves around the seasons and the land, with tea picking and growing taking center stage. From birth to death, the people of the Wuyi Mountains are instilled with a deep love and respect for tea growing and a mastery of the process to match. The Wuyi Mountains are a unique situation in the tea world. Isolated from pollution and protected by the United Nations as a World Heritage Site. The region can be thought of as a time capsule of tea. The teas grown in the region are done so in the traditional method by families who have been doing their work on the same land for centuries. The culture surrounds itself by tea and is centered around it. Its unique terroir gives the tea grown there a rock mineral note and accents and emphasizes tea’s natural sweetness and lightness on the palate. As mentioned last week, our Silver Needle White Tea is a prime example of a traditional Wuyi Mountain production.